This little gem of a book provides a wonderful introduction to the world of Celtic or Druid shamanism. Beginning with the essential explanations of who the Celts were, what druidry is, and of shamanic practice itself the author explains “the term ‘Celtic shaman’ is a modern one but we can draw sensible and logical conclusions extrapolating from what we do know, even if we are aware they may have used different names and terms of reference for their activities”; making a highly valid case for the contemporary use of this phrase. 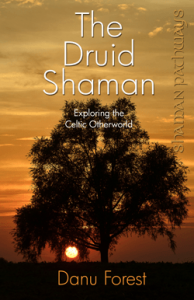 The Druid Shaman continues with chapters detailing a druid’s shamanic tools; the Celtic wheel of the year; finding your spiritual allies; power and spirits of place; the Celtic Otherworld and ‘Seeking the Radiant Brow, druid shamanic divination. Each chapter containing practical exercises enabling the reader to set out on their own explorations of the Otherworld should they want to do so. Combining archaeological sources, Celtic lore and contemporary practice, The Druid Shaman takes us into the realms of spirit, based in Celtic-Irish and British traditions. Clear and immensely readable, this highly recommended book provides wonderfully sound guidance from a basis of good research and the obvious personal understanding and experience of Danu Forest, the author.